Lemon Ginger Scones combine the fruity citrus flavor of lemon with the warm, sweet, yet spicy flavor of crystallized ginger. And I couldn't resist adding some sliced almonds to this dough. These scones are similar to the Coffeehouse Scone recipe on the site and again, we are using buttermilk, instead of heavy cream to moisten the dough. Buttermilk makes a lighter, more bread-like scone. A few notes on ingredients. Crystallized ginger is ginger that has been cooked in a sugar syrup and then coated with sugar. You can buy crystallized or candied ginger in small tins or tubs at some grocery stores or specialty grocery stores or in bulk form from health food stores. It will last indefinitely if stored in a cool dry place. Lemon zest is the yellow outer rind of the lemon that contains the fruit's flavor and perfume. To remove the zest I like to use either a box grater or a Microplane Citrus Grater or Rasp. This tool was originally designed as a woodworking tool. The tiny sharp-holed utensil can either be hand held or be a foot long rasp similar to the woodworking tool. If you are not familiar with buttermilk it has a nice thick creamy texture with a rich tangy buttery taste that makes baked goods tender. Whereas in the past buttermilk was made from the liquid left over after churning butter, it is now commercially made by adding a bacteria to whole, skim, or low fat milk. You can make your own buttermilk though by adding 1 tablespoon of white distilled vinegar, cider vinegar, or lemon juice to 1 cup (240 ml) of milk. Just stir the vinegar into the milk and then let it stand about 10 minutes at room temperature before using. 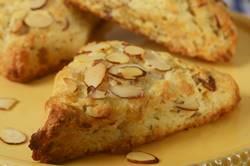 Lemon Ginger Scones: Preheat your oven to 400 degrees F (200 degrees C) and place oven rack in the center of the oven. Line a baking sheet with parchment paper. In a large bowl, whisk together the flour, sugar, baking powder, baking soda and salt. Cut the butter into small pieces and blend into the flour mixture with a pastry blender or two knives. The mixture should look like coarse crumbs. Stir in the chopped crystallized ginger, lemon zest, and almonds. Add the buttermilk to the flour mixture and stir just until the dough comes together. Do not over mix the dough. Transfer to a lightly floured surface and knead dough gently four or five times and then pat the dough into a circle that is about 7 inches (18 cm) round. Cut this circle in half, then cut each half into 4 pie-shaped wedges (triangles). Place the scones on the baking sheet. Brush the tops of the scones with a little cream and sliced almonds (if desired). Bake for about 20 minutes or until golden brown and a toothpick inserted into the center of a scone comes out clean. Transfer to a wire rack to cool.